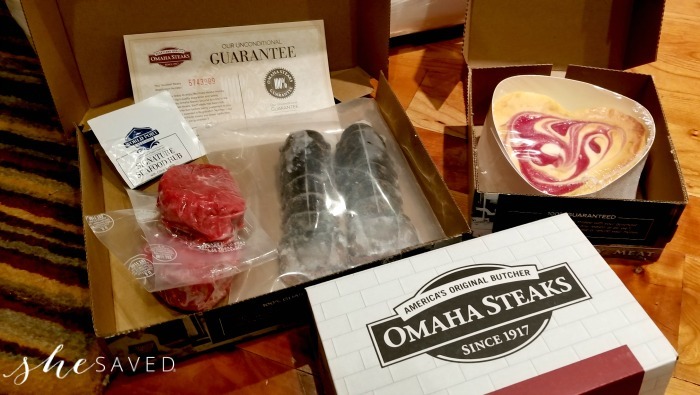 As you know, I’m a huge fan of Omaha Steaks, so much so that I recently signed on as an Omaha Steaks Brand Ambassador and I share this brand in confidence after recently returning from Omaha where I visited the farms, the processing plants, the shipping warehouses and even the test kitchens. I met the people behind this brand, I heard their stories and I witnessed their passion for these products and the care and attention to detail that goes into them. I feel great about serving them to my family and I think you’ll enjoy them too. Omaha Steaks products make wonderful gifts and the fact that you can score a great deal right now on the Valentine’s Day feast is a great way to completely win Valentine’s Day! Give this amazing box of food PLUS take care of Valentine’s Day dinner! This perfectly curated meal will be nearly as ravishing as your Valentine. Serve our BRAND NEW, fully-exclusive Omaha-Cut Ribeye – thick, tall, and triple-trimmed for the perfect portion – alongside succulent whole Lobster Tails and easy, creamy Potatoes au Gratin. Finally let the swoon-worthy taste of our NEW, award-winning, heart-shaped Raspberry Swirl Cheesecake take you and yours over the moon. With every bite baked by our unconditional 100% satisfaction guarantee, you can order and enjoy this feast with complete confidence today! 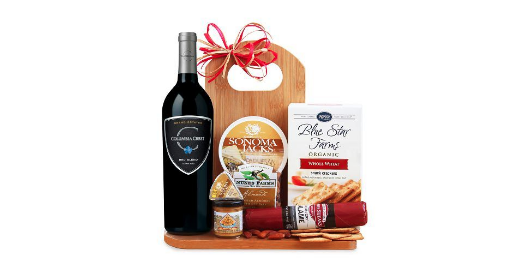 Another of my gift picks for this holiday season is this Gourmet Wine and Cheese Board Gift Set which ships for $64.99! This gift includes a variety of sweet and savory edibles with an attractive cheese cutting board. Creamy cheese, gourmet organic crackers, Omaha Steaks salame, whole grain mustard, and more are paired with Columbia Crest Grand Estates Red Blend. Omaha Steaks Italian Dry Salame 5 oz. Sonoma Jacks Parmesan Peppercorn Cheese Wedges 4 oz. Blue Star Farms Organic Wheat Crackers 5 oz. Napa Valley Whole Grain Mustard 1.75 oz. Nunes Farms Sea Salt Almonds 1.5 oz. I will leave this giveaway open until December 17th at midnight (mnt time) … once closed, I will select one winner who will have 48 hours to contact me to claim their prize! GOOD LUCK!! I’d share this with my hubby, son and daughter-in-law. Would share with my wife and sons. I would share this awesome food with my family! I would share with my family and beagle. I would share with my Husband and Family. I would share with my son and his family! I would share this with my husband of 35 years. My sister and her husband helped me out recently with some house stuff, so I would give this to them. I would share with my husband! We both love steak, veggies and potatoes. it's the perfect meal! What an awesome way to spend Valentine's Day. Thanks! I'd share it with my husband! I would share with my husband and son! I would share this incredible meal with my husband and two daughters, they would absolutely love it! Thanks so very much for the chance! I would love to share w/ my sweetheart Jim ,add to this meal so my grandchildren and children can enjoy Valentines Day . Delicious meal ,as we all feel the love for each other . Thanks for the chance! I would share this with my fiance'! I know he would love it! I would share this with my mother. My father passed away and this would be very fun. My boyfriend...we just got a new grill. Fingers crossed! I'd share with my husband. I would definately share it with my hubby! He would love it. I would share with my daughter . I would share these with my husband and two teenage boys. I would share this with my husband if I should be lucky enough to win! I'd share with my husband and my dad who is living with us too. I would share this with my family - if I was lucky enough to win! ! I'd share with my husband and son. I would share with my grown children and their families. I would share this feast with my husband! I would share with my hubby and family. This sounds delicious! I would share with my husband, nice romantic meal! I'd share with my sailor (hubby) and daughters. Been a few Valentine's days we've missed together due to deployments but he is home this Valentine's day! I would share with my husband and daughter. I would share with everyone. Would share this with my family. Just started dating again after losing my husband so I don’t have a Valentine yet to share it with.